Not that y'all can buy any, but they ain't going to ban it yet. ATF will process the comments received, further evaluate the issues raised therein, and provide additional open and transparent process (for example, through additional proposals and opportunities for comment) before proceeding with any framework. Don't y'all get complacent. The ATF didn't say, "never"; they said, "not now." The Gun Control Act of 1968, with its unconstitutional "sporting purpose" language, is still in force. The ATF will come back and try to use that again to ban guns and ammo. ...the criteria being argued about include concepts like “sporting purposes.” The term appears nowhere in the Constitution, and its first documented enforcement over firearms was in 1938 German law. Likewise, the Constitution is similarly silent on any branch of government, let alone a federal agency, having legitimate delegated authority to override the clear “shall not be infringed” mandate in the Second Amendment. 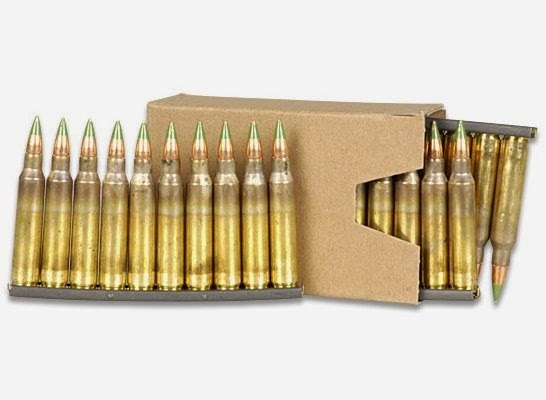 While arguments are correct that M855 ball ammo does not meet ATF’s own definition of “armor piercing,” the larger point, that there is no legitimate authority to impose such criteria in the first place, is being missed. So when ATF declares they’ll be back, until such time as that usurpation is addressed and resolved, it’s prudent to believe they will be, at the first political opportunity. Yes, they will. And we must push back against the attempted re-definition of our inalienable rights as permissions. Despite politicians' and bureaucrats' wishes, the 2nd Amendment of the Constitution does not confer permission to keep and bear sporting goods. The 2nd Amendment was designed to restrict government from infringing a preexisting, God-given, individual right to the same light arms that a government-backed military would use in war, to protect the people against the depredations of both tyrants and psychopaths, both individually and severally. The latter two groups, I admit, are deeply-intersecting sets.